Facebook is rolling out a major change to the structure of advertising campaigns that will significantly improve control for advertisers. This change impacts the self-serve ad tool, Ads Manager, Power Editor and third party interfaces. This roll-out begins March 4 and will continue through the month of March. If you don’t have it yet, get in line! The campaign was used to set the start/end dates and daily or lifetime budget. The ads were for picking creative, placement, targeting and bidding. You’ll choose an advertising objective for each campaign you create and that campaign will consist of one or more ad sets. This will help you optimize and measure your results for each advertising objective. The goal of all ad sets and ads within the Clicks to Website campaign, for example, will be to drive website traffic. These are quite broad, but you may also want to create separate campaigns based on a specific type of conversion. I’ll discuss that possibility later. You’ll be able to break down reports by Campaign and also easily start/stop all ad sets and ads within that campaign. An ad set will have one or more ads and you’ll continue to define the budget and schedule for each ad set. You can create an ad set for each of your audience segments by making the ads within the ad set target the same audience. This will help you control the amount you spend on each audience, decide when each audience will see your ads, and see metrics specific to each audience. Ad sets now behave in much the same way that campaigns did before. You will control the start/end dates as well as daily or lifetime budget of all ads within each ad set here. Facebook recommends that your ad sets be broken down by target audience. You’ll recall that your campaign was set up per objective. This is still rather broad as you may create ad sets for different email, website visitor, Lookalike Audience, precise interest or Partner Category segments. 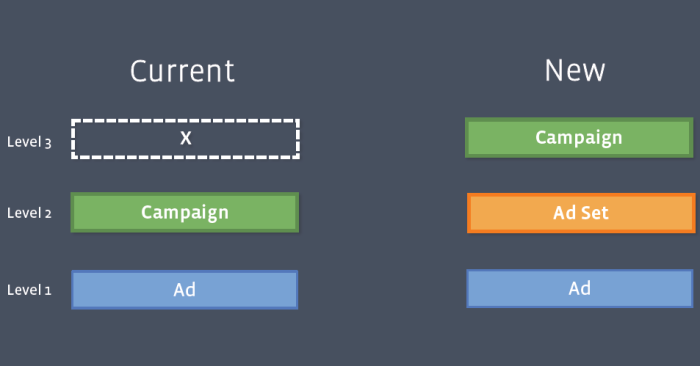 You will be able to break your ad reports down by ad set as well as stop or start individual ad sets within a campaign. Ads will now live within ad sets. You’ll continue to define your creative, target your audience, and select your bidding at the ad level. Multiple ads should be created in each ad set so our system can optimize for variations in images, links, video, text or placements. Very little, if anything changes here. You’ll continue to control creative, targeting and bidding on the ad level. As you can see from Facebook’s definition, however, they are pushing advertisers to lump together all ads that have a particular audience within the same ad set. Once again, let’s use the Clicks to Website campaign example. Reminder: All of these ads are targeted at the same audience. While the ad reports do a great job of breaking down performance by placement, you may create separate ads for sidebar and News Feed to optimize for different image sizes and copy limitations. Facebook will then optimize your ads, focusing on the ad variations that perform best. Once again, you’ll be able to turn ads on and off at this level as well as break down performance by ad within the Facebook ad reports. Your current campaigns won’t be impacted. They’ll continue to deliver as they are now, and you shouldn’t see any change in performance. The only change you’ll notice is that a default ad set will be created within your old campaigns that will hold all ads within it. This vastly improves organization of your advertising. I may have one or a handful of ads within each campaign, depending on whether I created variations of those ads. I did this because I didn’t want Facebook to optimize by audience. 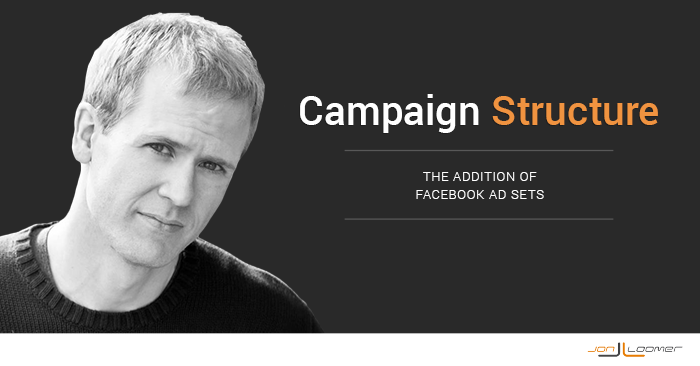 I wanted a set budget to run for each audience, and Facebook could then optimize within that campaign. Well, this process will now be much cleaner. I’ll create one campaign for the specific post to be promoted with ad sets for each audience. This also improves ad reporting. If you aren’t using Facebook ad reports, you are missing out on some hidden gold. But creating these reports with the old campaign structure was somewhat complicated since it was important to include key words or phrases in campaign names to filter your results. But now you can simply filter by campaign name and you’ll get all relevant information by ad set and ads. Since I don’t yet have this update, I have assumptions about how I’ll use it. How about you? How will you use this new campaign structure?